WebTitan provides feature rich functionality to allow you manage internet policy and protect your organisations data and users. Below are feature details as well as technical information to allow you to download and install WebTitan. 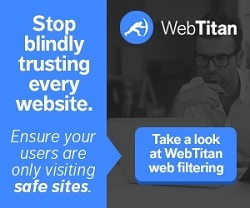 WebTitan offers URL and web filtering of up to 53 predefined and 8 customizable categories including 10’s of millions of URL’s which works in conjunction a cloud based look up and real time classification system to provide unmatched combination of coverage, accuracy and flexibility. WebTitan filters block phishing attempts protecting users personal information from theft. WebTitan can block unwanted keywords and attachments including file types, mime types and renamed files. This can be enabled via the policy engine allowing administrators to block unwanted content in line with the organizations internet policy. WebTitan contains a highly granular policy engine allowing the administrator to build browsing policy based on users, groups, categories, working times plus much more ensuring enhanced productivity. WebTitan contains a comprehensive reporting suite providing automated graphical reports including user and group browsing reports, top URL’s , browsing times and many more. WebTitan allows organizations to block access to unwanted applications, such as IM and Peer to Peer. WebTitan contains a proxy server including cache for improved resource utilization. All updates, including anti virus, new version releases, configuration back up, URL category updates and management reports are automated, thus requiring the minimal management overhead possible while ensuring maximum security. WebTitan contains a comprehensive suite of diagnostic tests and reports providing both the administrator and WebTitan support with all the information required to fully investigate any support issues. This includes the ability to send a diagnostic report to WebTitan support and remote SSH authenticated log on from WebTitan support. All WebTitan features are accessed using an intuitive web based interface. This allows controlled access from the network and removes the need for client based management software. Restrictions can also be put in place to limit who and where this interface can be accessed from. SSL/HTTPS inspection feature. Encrypted content pages and traffic can be decrypted, examined and compared to your policy settings, scanned for viruses and malware, and only if appropriate, re-encrypted and forwarded to the client. Enforce “YouTube for Schools” and “Safe Search”, which removes inappropriate results from search engine results, a key issue in the education sector when offering internet access to minors and children. The Safe Search facility within WebTitan supports all leading search engines, including Google, Bing and Yahoo. As WebTitan Gateway contains both the WebTitan application and its own operating system, a hardened Linux platform, including scripts for self installation, there are no operating system requirements.